Saturday we had two losers but this week there's a lot to look forward to. Still 16 winners from 27 selections so far in April. 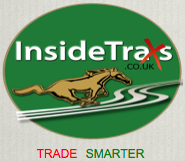 Please follow the link for our unique TrackFaxs briefings on Pontefract Racecourse AND Windsor Racecourse; it tells you about the draw, pace analysis and riders & trainers records at the course. Hugh Taylor as one selection today. The NAP OF THE DAY runs at Pontefract 2.50. Overall worth a punt at around 4 on Betfair. Will definitely front run and I expect him to be still there as they approach final furlong which should mean we get some decent shortening in the price. Whether he can last out the final 1.5f uphill finish is unlikely but not impossible. Last seen at Lingfield where he was a respectable 5th he is now down to a mark of 68. He won last June at Leicester (uphill finish) over 5f off 72 (Class 5) and at Bath (uphill finish) in May off 68 over 5f so he is weighted to give a good account if stripping fit enough after a 132 day break. The chart below shows his in-running lows which are quite promising. ADVICE: Back to Lay looking for 50%+ profit on your stake. He may set up a big lead so watch the race and make decisions in running. Currently trading at around 35 our unique “Back to Lay Staking Calculator” will advise you to lay at 23.33 to get 50% return guaranteed on your money. Won the race last year (by short head) completing a five timer and obviously runs well here. Did well at Doncaster LTO and so deserves to have a chance here. However he is up against a few speedy types here and he may find it hard to remain prominent. He is also up against other course specialists such as Poyle Vinnie (won LTO), Watchable and War Whisper. This horse is too short at 3.75 and is a LAY. Dropped to close to his last winning mark of 69 when he won here over C&D about this time last year coming with an amazing finish. If he gets a run this time he will not be far away. At the moment he is around 4.0 for a top 4 finish in a 9 runner event!